Researchers have found another reason to treat periodontal disease as soon as possible. They discovered that byproducts of bacteria in gum disease, called metabolic small chain fatty acid (SCFA), can work together to wake up HIV in dormant T-cells and cause the virus to replicate. Their findings, published in the journal Virology, help explain why people with the HIV-infections and periodontal disease have higher levels of the virus in their saliva than HIV patients with healthy gums. In the interaction between gum disease and HIV, five SCFA byproducts from two prevalent oral bacteria - Porphyromonas gingivalis (Pg) and Fusobacterium nucleatum (Fn) - are involved in activating resting immune T-cells carrying latent (inactive) HIV-1 virus. The process acts much like the jumper cables attached to a live battery recharging a dead one to get it running again, according the researchers. They explained that all humans have a reservoir of resting T-cells that wake up and respond to inflammation to ward off an infection in the body. But for people with HIV, these T-cells can also have the sleeper HIV-1 virus, which remains in a dormant state until awakened. Last year, the researchers discovered that one SCFA - butyric acid - induced a chain of events that reactivate the virus associated with Kaposi's sarcoma, the most common malignancy in HIV patients. Following that discovery, the researchers expanded their investigation to all SCFAs. They found that a high quantity of butyric acid activates the T-cell and incites virus replication. But smaller amounts of the five SCFA, working together, have the same impact. 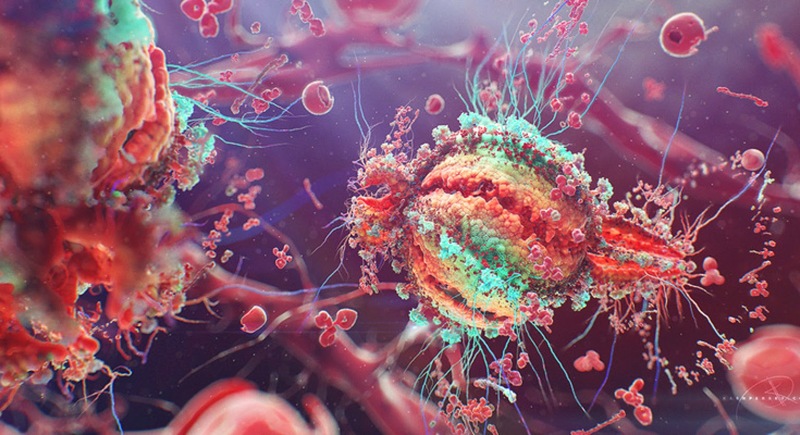 The impact on waking up T-cells and activating HIV replication was a "double whammy" find that contributes to understanding the little-known microbiome in HIV disease. That prompted the researchers to investigate the mechanism that drives the replication of the virus in gum disease. HIV antiviral therapy prevents active HIV cells from replicating and doesn't affect the quiet viruses in sleeping T-cells. As long as the patient is free of gum disease, the virus sleeps and remains in check, the researchers said. Originally published by Case Western Reserve University.